Director Carmen Reyes-Zubiaga of the National Council on Disability Affairs (NCDA) appeals for support to Ever Gotesco Mall management to make their establishment friendly to persons with disability. This was undertaken during the Sensitivity Training on Assisting Customers with Disabilities participated in by front liners, security guards, tenants, concessionaires and utility workers who were also guided (photo below) on how to assist customer on wheelchair and person with visual impairment. 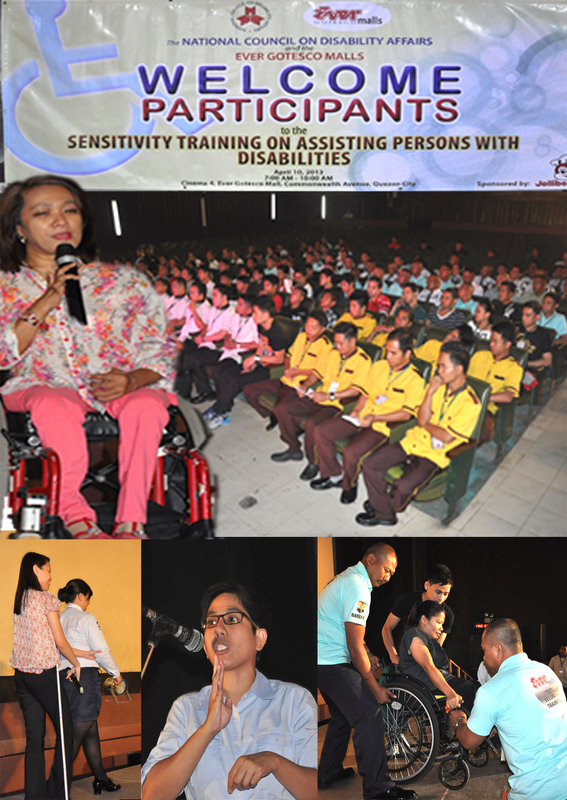 Part of the Sensitivity Training was a Photo Exhibit which featured accessible buildings and establishments in national government agencies, local government units (LGUs), government elementary and high schools, government hospitals and private organizations.